Sky is a major global brand, with a dominant sports subscription channel and numerous other media interests. Their bookmaking arm, Sky Bet, was launched back in 2000 when the company bought up a diminutive online betting firm named, Surrey Sports. After a quick rebranding drive and many other acquisitions, Sky Bet was born in 2002. They operate solely online and are regulated by the by Alderney Gambling Control Commission, as well as the UK Gambling Commission. You can find over thirty markets to choose from on their site and the odds are reliably competitive in most instances. Along with the most popular sports, like football, cricket and horseracing, you can also find plenty of obscure events if you like to have a side line. To keep up with all the latest news, visit the Sporting Life tab which provides tips, news, fixture updates and columns from industry experts. Sky is one of the biggest names in UK sport and their TV channel screens a huge range of events throughout the year. This coverage includes the various markets on their betting site, so there really is a sport for every punter. The extensive list includes; Aussie rules football, basketball, cycling, formula one, handball, ice hockey, MMA, rugby, snooker, and winter sports. You can also refine a search by tournament; just browse through the left hand side of the page for information on popular clashes like the Six Nations or the Premiere League. If the sport is shown on their TV channel, it’s likely you’ll find it in their sportsbook, from World Cup finals to squash, yachting, and even specials that focus on TV and film. However, as a UK based company the primary focus is on UK fixtures, with football and horseracing taking centre stage. Football games can have hundreds of betting lines, including some that are difficult to find elsewhere, like whether the 3rd official will add any time, and how much that could be. 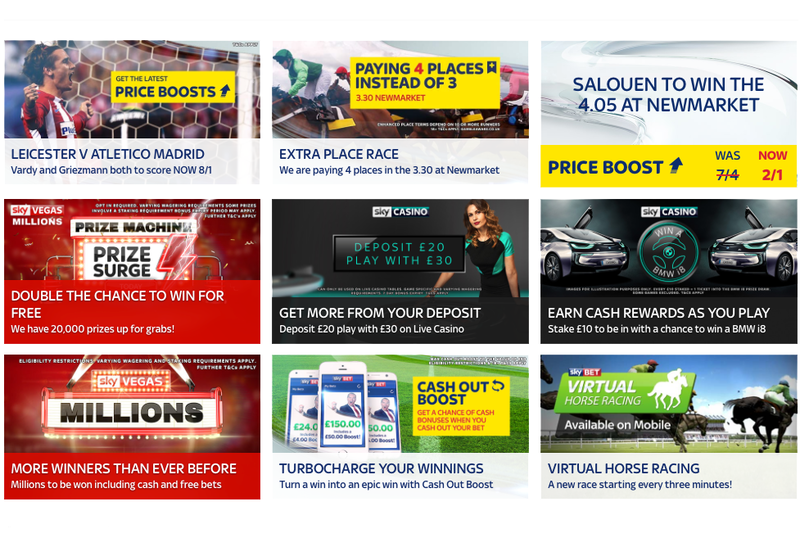 Sky Bet have created their sportsbook as a standalone site, so unlike the majority of online bookmakers you don’t get the chance to click over to the casino for a few card games, or to speculate on the financial markets. To do so, you’ll need to navigate to another product, like Sky Poker or Sky Bingo and also sign up there. The lack of extraneous content may come as a relief to some, but others will miss the added entertainment value of Vegas style games. Sky Bet claim to have the Bests Odds Guaranteed each day on every Irish and UK horse or greyhound race. This applies to each way, single and multiple bets, on each qualifying race, every day of the year. For example, if you have placed a bet on a greyhound or horse that wins at a starting price of 5/1, but was placed at 5/2 earlier, you will still get the better value odds. On this bet it would net you an extra £25 if you entered a £10 stake, so for people who enjoy domestic racing this is a great little offer. In terms of odds, Sky Bet has earned a fair reputation across the sportsbook, though they tend to be more generous on football. The odds here will not always be the best around, but they are competitive and a number of enhanced odds deals can add to their value. 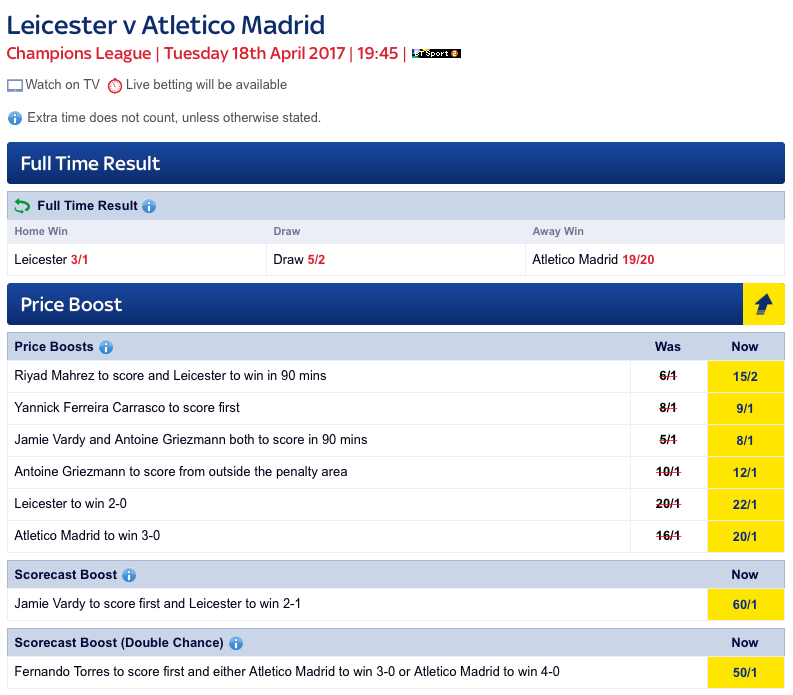 One type is the ‘price boost’; here a whole list of odds is enhanced right before a game. This could be on a certain striker to score and his team to win, and the odds could move from 5/1 to 7/1. You can find these promotional odds in the left hand menu under Promotions. Always have a look here before laying down your bets, as there is usually a swathe of more favourable terms to snap up, especially on highly anticipated events. You can see the odds on offer shown as both fractions and decimals; the site renders them very clearly in white against a blue background. If there’s a market or a line you’d like to try, but it’s not mentioned on the site, they say they will always provide odds and prices if you give them a call. 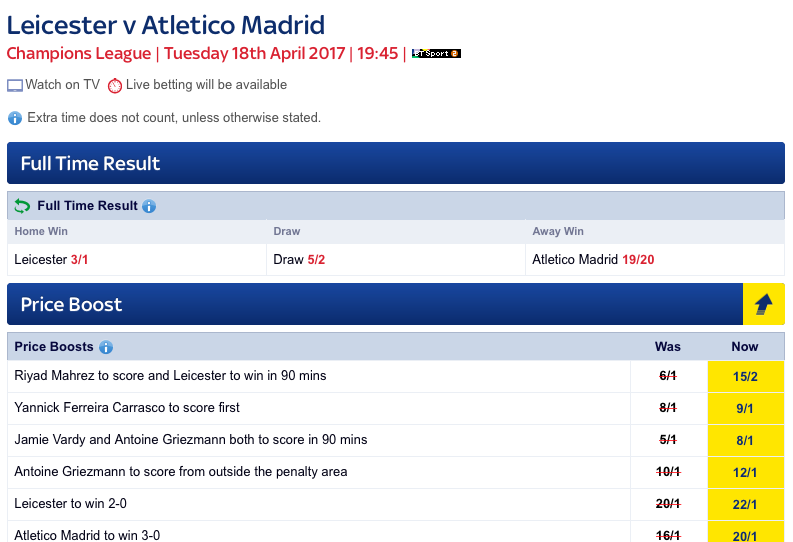 The Sky Bet website is attractively rendered in deep blue and simple to get around, with a wide range of clearly labelled links. The interface is ideal for everyone from first time visitors, to people who’ve had an account for years – because it behaves in exactly the way you’d expect it to. Sky have a wealth of broadcasting experience and this is very evident on the site, information is well-laid out, there’s an absence of clutter and the sections make sense. One feature that’s bound to be a hit with anyone who likes to place a few crafty bets when they’re at work, is ‘Boss Look Busy’. This can be reached through the red and black icon above the social media buttons. Click it to switch the screen to an official-looking spreadsheet showing a series of comical graphs and charts, with titles like ‘How believable are sports presenters?’ and ‘% of comedy pie charts that are actually amusing’. 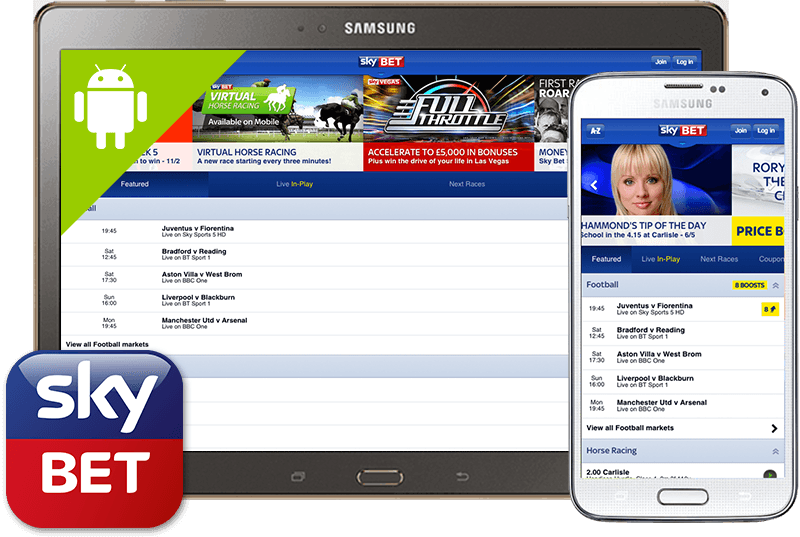 To keep their followers up to date with the latest odds, news and markets, Sky Bet have developed a mobile app that contains all the functionality of their desktop site. The app can only be downloaded by iOS users right now, but for people with an Android gadget the browser-based experience is identical and delivers the same level of service. The app provides access to all the sports and markets, from anywhere that has a wi-fi connection or suitable phone signal. At the touch of a button, you can open the market you need, visit the extensive in-play section – which is also known as Sky Bet live – and use pre-prepared coupons to place complex wagers in seconds. The menu is designed for simplicity, with an interface which lists sports from the most to the least popular, so you won’t end up scrolling through obscure events, just because they’re higher up the alphabet. This area also has a few little images which work to break up the text and make the whole area seem more spacious. Locating and placing a wager is fast, and if there are any Price Boosts available, they are well signposted. In general you’ll see a couple of these offers each day, but they can only be used on certain bets and markets, so not all will be relevant to you. If you strike it lucky, you can withdraw your winnings into your account using the app, though you’ll need to have your withdrawal method authorised beforehand. Other than Major League Soccer from the US, you won’t find many live streams on the Sky Bet app, which will be a let down for some players. The in-play betting is good however, as it covers plenty of matches and games, but with graphics to illustrate the action instead of a stream, it does feel that something is missing. With a huge range of sports, a sophisticated interface and stunning visuals, you’d expect a fantastic in-play section as part of the package – and Sky Bet does not disappoint. If you want to place one or more bets as the action is unfolding, you can find the live bet menu on the homepage to the right. Here they publish details of each sport and the different types of bet you can go for. Using what they call the Sky Bet Player, you can watch up to six live streams at any one time, you can also browse forthcoming events and place in-play bets. The odds are updated constantly for every event and once you’ve selected one, the console will change to show the live score, the odds, and a graphic showing the action as it takes place. Thousands of games, matches and races are streamed by Sky Bet throughout the year, but in order to watch you’ll need to place a £1 bet and have an account that’s in credit. Register for an account with Sky Bet and even before you place an initial deposit, your balance will be topped up with £10. You can place this on any sport. Accurately predict the results of six set matches, and you’ll win a large payout. Enter for free. 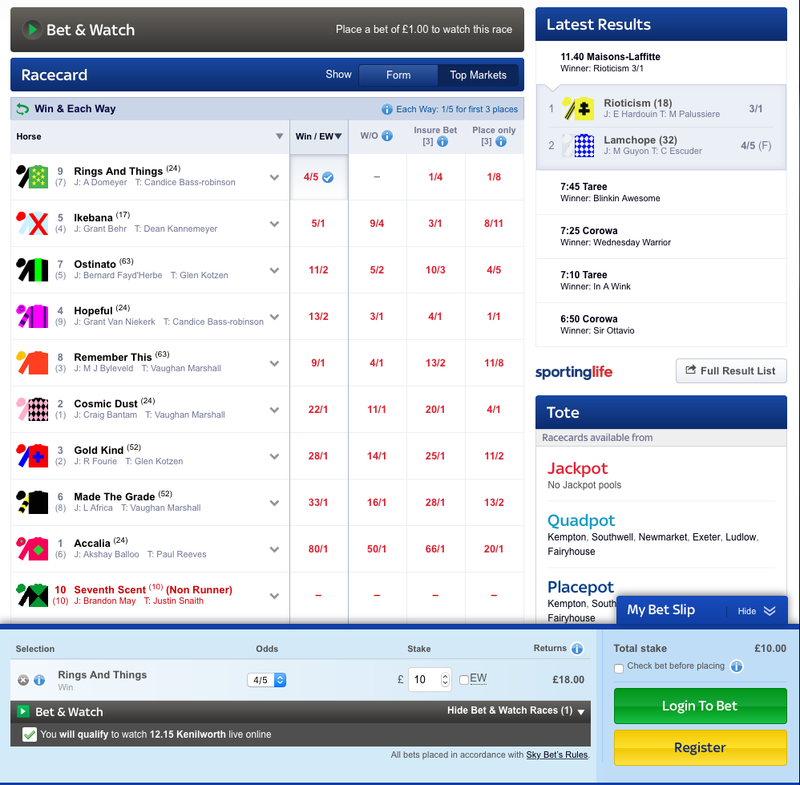 If you back a horse that eventually runs at bigger odds, Sky Bet will payout any winners at the bigger odds. This is valid on all horse races in the UK and Ireland. When you log in you’ll be prompted to join the Sky Bet Club. Membership is free and if you stake £25 worth of wagers, all of which have odds of 2.0 or more, before midnight on any Sunday, Sky Bet will throw in another £5 free bet. Be warned; if you miss a week you’ll have to stake £40 to get back in the scheme. When it’s time to pay funds into your Sky Bet account, there are many methods you can use. They currently accept; Maestro, Visa, Neteller, PayPal, Skrill, MasterCard and bank transfers. The easiest way to begin is by logging in and navigating to the My Account area – this is located in the top right of the site. From here you click deposit, and choose the payment method you wish to use – assuming it is already on the account. If not, you’ll need to enter the details and provide documents to prove your identity; these can simply be emailed across. Once you have an authorised method in place, just choose an amount and click Deposit Funds Now. If your payment provider requires it, you may be redirected to another page to follow their security protocols. When the process is complete, the funds will be in your account immediately. Sky Bet do not have any deposit charges, but occasionally some banks apply a levy to transfers, as they are sometimes considered to be a cash transaction. If you are unsure, contact your bank for more details. Withdrawing money is simple if it is going back to an original payment method. It can be done by visiting your account and selecting Withdraw Funds and typing in the amount. The minimum withdrawal is £10. This will usually take between 2 and 5 days, but it’s usually faster using eWallet services. If you are requesting funds are paid back into a new bank account, card or eWallet, Sky Bet will ask for documentation which proves your identity. This is to reduce the risk of fraud and money laundering. Sky Bet has trained a great team of customer service assistants and they can be reached 24/7 using three different methods. Their email address is [email protected], or you can reach them by clicking the live chat icon, or call on 0330 024 4777. Sky Bet is highly security conscious, each financial transaction is transmitted through SSL software and data protection is also taken seriously – so your details won’t be shared. Regulated by the Alderney Gambling Control Commission, Sky Bet is registered under the name Bonne Terre Limited and they also have a UK Gambling License. This means they are obliged to comply with a strict set of conditions, including; preventing people under 18 from gambling, ensuring that each transaction is transparent and preventing any type of fraud from affecting clients. 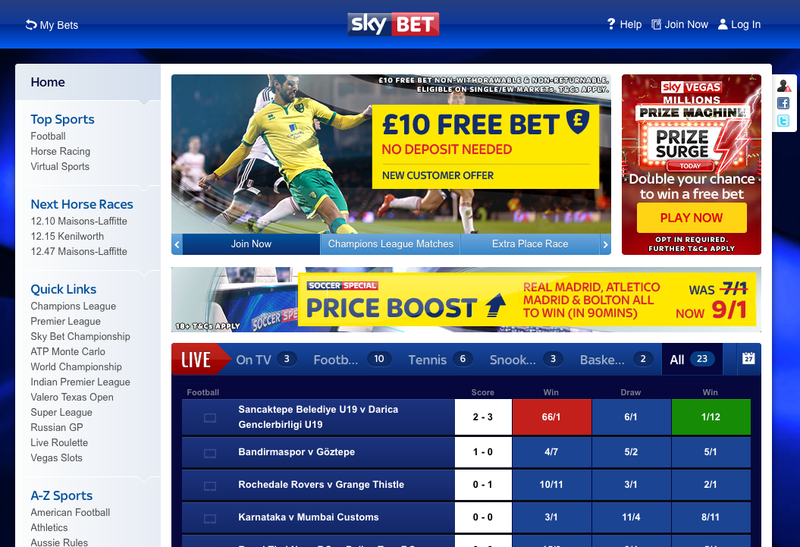 As an online bookmaker, Sky Bet is quick to introduce new sports and markets to meet the demands of their clients. They have a big, impressive site with lots of choice and a solid in-play betting console. Live streaming on the app needs improvement, but that aside, the mobile interface, like the desktop version, is responsive and simple to use. Regulation from the Alderney Gaming Commission means games and working practices at Sky Bet are regularly checked for fairness, and strong SSL encryption gives you peace of mind that your account is secure. In all, Sky Bet has developed a great looking site with plenty of choice, and gained a reputation for trustworthiness.